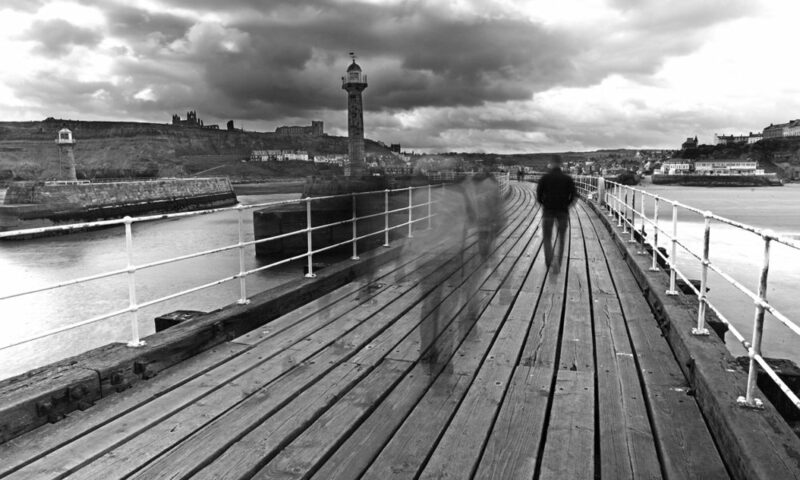 With a wealth of folklore, Whitby has more than a few ghost stories to share. Like many historic coastal towns, Whitby is associated with more than a few ghostly stories. Whitby’s reputation for things that go bump in the night is further spurred on thanks to the author Bram Stoker and his reference to the town in the popular novel, Dracula. However, those who have visited Whitby and walked through the town at night may have had their own spooky encounters. Certainly there is something rather curious and eerie about traversing the winding cobbled streets late at night, walking past the lit, inn windows and listening to the sound of crashing waves in the distance. After walking up the ascending cliff path, you eventually find yourself at the foot of the Abbey steps, the large ruins standing above you bathed in moonlight. The windows, resembling dark charcoal smudges against the starry backdrop, a cold wind whips through the alleyway causing the signs to creak and swing and a howl is heard from across the moors. So with the scene painted, why not relax in the safety of your Whitby holiday cottage, pour another mug of cocoa and turn up the fire. Here’s a look at some of Whitby’s most popular ghost stories. A popular legend, The Tale of the Phantom Coach takes place at the top of the Abbey steps. The story says that if you were to walk up the 199 Whitby abbey steps on a cold dark night, where even the light of the moon only just illuminates the ground and stand outside St Mary’s Church, you may be in for a fright. Standing in the grounds of St Mary’s Church, the structure towering above you like the proud sibling of the Abbey ruins, you might hear the sound of horses approaching in the distance. If you can further muster the courage to stay, you may see a ghostly horse drawn carriage charging towards you, with the driver furiously whipping the horses, the sound of the horses’ hooves heavily pounding the ground like thunder. As the carriage approaches, the figures are barely visible and then the carriage hauls up outside the church entrance, horses rearing on their hind legs and disappears. To this day the reason for the apparition’s appearances remain something of a mystery and we can only speculate as to what may have occurred to cause the figures to return. Although known by many names, the huge, muscular, dog-like beast is most commonly referred to as The Barghest. Tales of this creature reach back many years and the mention of a huge black dog running from the ship in Bram Stoker’s novel has further added fuel to the story’s flames. Common legend has it that The Bargehst stalks its prey on the North Yorkshire Moors surrounding Whitby and that it preys on farmers’ livestock and wild animals, using its jet black fur to blend in with the night. However, should you find yourself out on the Moors one evening, sunlight disappearing behind the tree lined hill tops, mist beginning to cling to the ground like seaweed and hear a blood curdling howl, seek shelter soon as the Bergehst only stalks the victims who hear its wolf-like cry. Although known by many names, including boggles and boggarts, a Hob is commonly the name given to a small mischievous goblin-like creature, believed to inhabit the caves around Whitby. Known to be bad tempered, folklore tells us that they often moved into people’s houses and wreaked havoc by turning milk sour in the night, frightening livestock and generally being an uncontrollable nuisance. Once a Hob has decided that it’s chosen your home, they can be near impossible to remove. Some believe that if you try to leave them behind and move house, they would always simply follow. In fact Hobs have even influenced many village names in and around Yorkshire, presumably where one may have dwelled. A good example is Boggle Hole, which is a small village just outside Whitby. There is some good news though and it’s that not all Hobs are bad. Some old legends speak of them being able to heal the sick and that the Hobs who lived in the caves around Whitby’s cliffs would help cure children brought to the caves by their mothers. Others believe that Hobs were made up by smugglers who used the caves for storage and needed a story that would ensure their privacy. Want to stay close to Whitby Abbey? 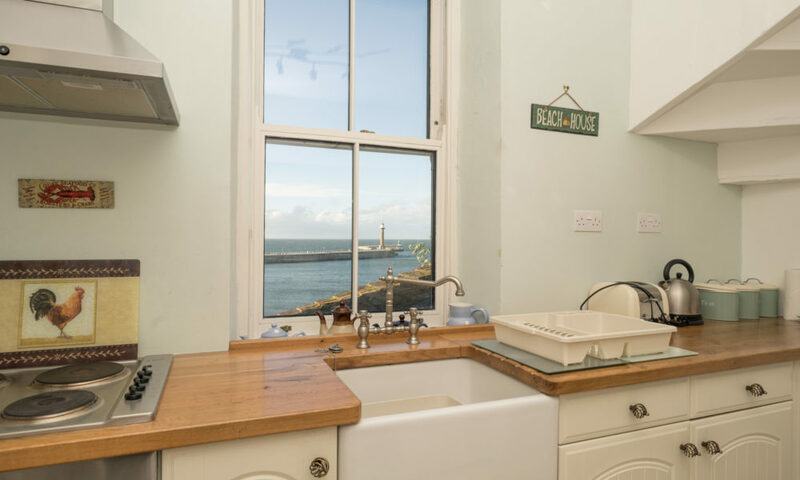 A real gem that puts you close to Whitby Abbey on the East Side and has the best sea views!